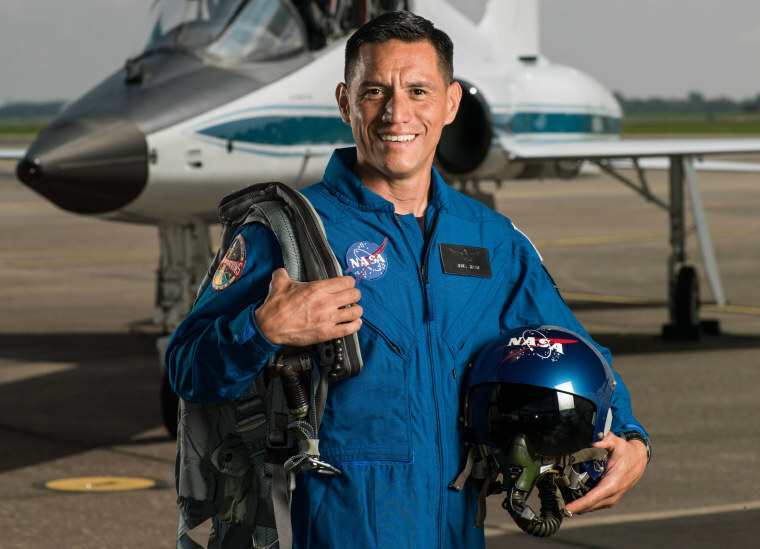 By the time you read this, Frank Rubio, who was chosen as one of 12 astronaut candidates from NASA’s largest pool of applicants in history, will already be starting his two-year basic training. Becoming an astronaut wasn’t something Rubio had planned as a kid. Still, he admits “every kid thinks of how awesome it would be." Although Latinos are underrepresented in science and technology, Rubio is part of a small but influential group of Hispanic astronauts. “I think the opportunities are limitless for us just like they are for anybody else,” Rubio told NBC Latino during one of his final interviews before beginning training. Rubio’s family is from El Salvador. He was born in Los Angeles and as a teenager moved to Miami, the city he calls home. He attended public high school and eventually graduated from the U.S. Military Academy at West Point. Rubio flew over 600 hours of combat missions during deployments to Bosnia, Afghanistan, and Iraq as a UH-60 Blackhawk helicopter pilot. He later went on to medical school and became a family physician and flight surgeon. This list of accomplishments was not enough for Rubio. He applied to become an astronaut and at 41, was chosen out of more than 18,000 applicants. He hesitated telling his mother, who now lives in El Salvador, that he would be going into space. Afraid of what her reaction would be, he waited until the week he found out he was selected. Rubio, who is married and has 4 children, was serving as battalion surgeon for the 3rd Battalion of the 10th Special Forces Group in the U.S. Army when he was selected. What’s the best advice someone ever gave you? My mom from early on just instilled in me to do my best at whatever it is...And I think that has made a bigger difference for me throughout my life than maybe talent or anything else. What's your guilty Latino pleasure? Food. I say all the time that I work out, half the time, just so I can enjoy the yummy food we have. And I miss Miami mostly for that. The people are awesome, I miss the culture and the weather. But the food there is just phenomenal. And I like all types. Obviously, my family is from El Salvador but I love Cuban food, I love Nicaraguan food. It’s all good.